Christian (Claes Bang) is the respected curator of a contemporary art museum, a divorced but devoted father of two who drives an electric car and supports good causes. His next show is “The Square”, an installation which invites passersby to altruism, reminding them of their role as responsible fellow human beings. But sometimes, it is difficult to live up to your own ideals: Christian’s foolish response to the theft of his phone drags him into shameful situations. The 'The Square' competition has now closed. Winners will be announced shortly. Competition opens at 5pm AEDT on Sunday 18th February 2018 and closes at 11:59pm AEDT on Sunday 25th February 2018. Ten winners will be chosen at random on Monday 26th February 2018. To successfully win, entrants must fulfil the above entry conditions before the time the competition closes. Current members/followers are eligible to enter the competition. Only one entry per person. Only one winner per household. To be a valid winner, the entrant must not have won a prize from SWITCH within the last 28 days. Each winner will receive one double pass to 'The Square'. By entering, you agree to receive occasional emails from SWITCH in the future. If you decide to unsubscribe from these updates, any further entries will not be applicable. Only Australian residents are eligible to enter. 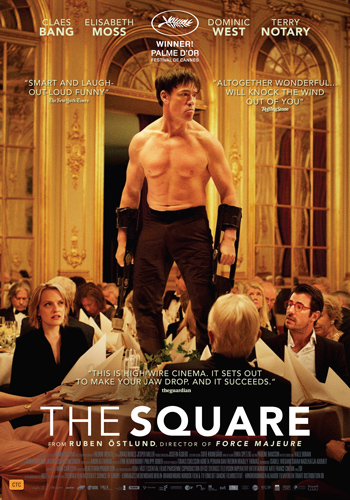 'The Square' is in cinemas from Thursday the 1st March 2018 through Sharmill.